We all like to know about the company we are purchasing products from. Knowing about the business will make you feel more comfortable about buying from them. Well, before I give you information about Stack-On Gun Safes, going to tell you a little bit about the company you are about to purchase from since they aren’t as famous or as old as some of the other companies. The company was founded in 1972. People have trusted Stack-On for over forty years. They offer many products such as gun cabinets, tool chests, tool boxes, and many more products. Stack-On is well-known for their safes for a few different reasons. At the end of the page, I’ve laid out some more information for you detailing the reasons. 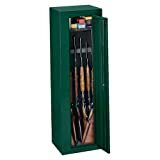 Check the following Stack-On gun safe reviews and accordingly have a look at outstanding Stack-On features that will give you an idea of what the company has to offer you. We start off with the Stack-On 14 gun safe review. This safe will hold fourteen guns, or you can store seven guns and use the rest of the space to store other valuables. The safe is equipped with four adjustable shelves which will be suitable for small valuables or ammunition. The interior is fully carpeted to keep your guns and valuables from being scratched by the steel. 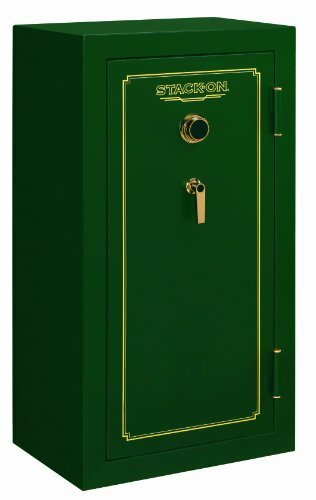 This safe comes with a lifetime warranty and a five-year limited warranty. Safe is easy to secure to the floor with the pre-drilled holes. You do not have to worry about not being able to gain access during a power shortage since this safe has a combination lock. Many combination locks on safes have problems such as the lock feels loose, or it is stiff. The lock on this safe has a good feel and spins smoothly. 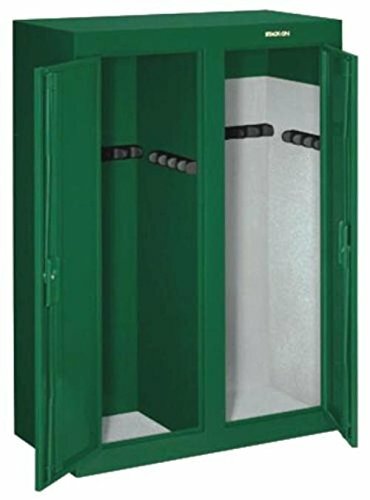 The Safe has pre-drilled holes so you can anchor the safe to the floor but with the safe weighing three hundred pounds empty you do not have to worry about an intruder stealing the safe. The safe has a divider built in the middle making it easier to keep everything organized. One side is for your shotguns or rifles, and the other side has shelves for storing ammunition or other valuables. The safe comes with a combination. You cannot change the combination. The safe will not hold fourteen long guns. It will hold fourteen guns if you are counting your handguns. After years of use, the combination dial will start getting stiff. In order to prevent this, you should lubricate the dial often. The shelves do not fit properly, so they rock back and forth a little bit. This safe will hold twenty-four guns or twelve guns and have storage room for other valuables. 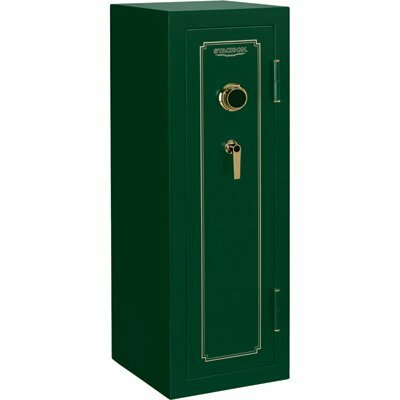 Like many other Stack-On safes, this safe is equipped with four adjustable shelves and a carpeted interior. The combination lock is drill resistant making it nearly impossible for anyone other than the owner to gain entry to the safe. The safe also has five locking points, unlike many other safes that have three. I hope you found this Stack-On 24 gun safe review insightful. The following are a few pros and cons of this product. It is not dependent on power so you will not lose access to the safe during a power outage. The anchor bolts are easy to install, and they are included with the safe. Unlike many other safes, the dial is easy to turn and not stiff. The safe is equipped with three deadbolts and three live locks. When the safe is locked the door has a little play in it. This will not allow someone to gain access to contents of the safe. The carpeted interior is a little sloppy and might be coming up in spots. This can be fixed with some cheap glue from your local hardware store. This safe is made of thinner metal than some of the other safes on the market. If you want a thicker gauge of steel, you should look into a more expensive safe. The locking lugs do not go into a solid base. This is the reason the door has a little rattle to it. This is a smaller gun safe. It holds eight guns unlike many of the others that hold at least fourteen guns. This is a smaller gun safe so you can set it up in tighter places than you could many other safes where you have fewer options of where to put the safe since they are much larger. It has a foam padded bottom and barrel rest. This will keep your guns from being scratched by the steel. You have to assemble this gun cabinet, but it is easy to assemble. This is a smaller safe, but you can secure it to the floor with the pre-drilled holes. 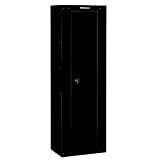 Continue reading this Stack-On 10 gun safe review for more features that are packed in this gun safe. You can install the door to open in either direction. The assembly instructions are clear and easy to follow. It will take you less than an hour to assemble the safe. The best thing about this safe is it will keep your guns away from kids for less than a hundred dollars. The safe weighs less than one hundred pounds so you can easily move it if you decide you want it in another part of the house. The outside looks like a more expensive gun safe. The safe probably wouldn’t stand a chance against an experienced thief. The shelf is only big enough for a few boxes of ammunition or a small cleaning kit. The safe does not have anywhere to store handguns. It is made of thin metal that can be cut if an intruder had the time. The combination cannot be changed. The company sets the combination of every safe. If you lose the combination, you can call customer service, and they will give it to you. 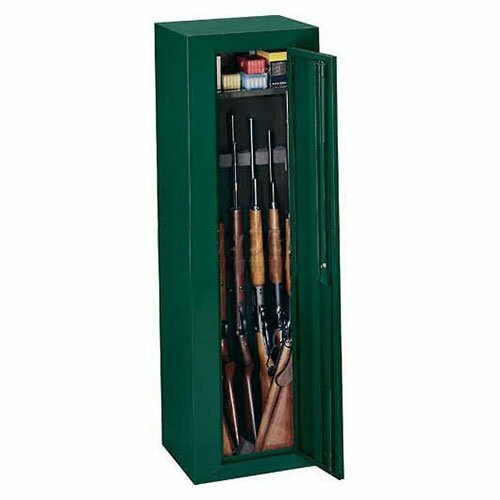 This gun cabinet has two doors and will hold up to sixteen rifles or shotguns. The bottom and sides of the cabinet are lined with foam to reduce the chances of your guns being scratched. One side of the cabinet is for storing your shotguns and rifles. The other side of the cabinet is equipped with four large removable padded steel shelves. The shelves can be removed to make room for fifteen more guns if you have a large collection and don’t need the shelves for storage. Has pre-drilled holes in the back so you can secure the cabinet to the wall, unlike with many that have pre-drilled holes you can use only to secure them to the floor. This is a unique characteristic. The Safe has plenty of room so you can add to your collection without worrying about having a place to store them unless you already have a large collection. The safe is lightweight so one person can move or assemble it. Four large removable shelves for handguns, ammunition, or any other valuables you wish to store in the safe. The floor and walls are lined with foam padding, so your guns do not get scratched by the steel. Each side has a different key. It would be a lot better if one key fit both sides so you would not have to keep track of two keys. The safe is lightweight which is a pro, but it can also be a con. The gun cabinet can be stolen by a criminal if it is not secured to the wall or floor. There isn’t a dust seal on the doors. You can purchase a cheap seal that will do a good job of keeping dust away from your valuables. The lack of seals on the door makes it useless to use a dehumidifier. The metal is thin enough that you can quickly drill more holes to anchor the safe. This is a bad thing since a thief can drill their way into the safe if you are away from home. This cabinet will hold ten rifles or shotguns. It is equipped with a steel shelf you can use for storage or you can remove the shelf. If you do not remove the shelf, you cannot store long guns in the front of the cabinet. It has pre-drilled holes so you can secure it to the floor or wall which is always a good idea if you purchase a small safe that can easily be moved. This safe has a one-year warranty. The warranty covers defects in the material or workmanship. This cabinet can be stored in a small area, unlike many gun safes. It is equipped with a steel shelf that is removable. The gun cabinet is lightweight so it has pre-drilled anchor holes so you can secure it to the wall or floor. The cabinet is lightweight making it easy to move if you want to relocate it. The cabinet is only good to keep your guns away from children. This safe will not keep them away from a thief that comes prepared. It will not hold ten guns if you have scopes on your weapons. This cabinet will not protect your guns from fire or water. If you want one that is fireproof and water resistant you to look into the gun safes which are more expensive. Click here to see the fireproof safes list! All Stack-On Gun Safes are ETL Fire Rated for thirty minutes in temperatures up to 1400 Degrees Fahrenheit. They are also California DOJ-Approved Firearms Safety Devices. All Stack-On Gun Safes also have three points locking systems making them nearly impossible for a thief to gain access. Stack-On does not have a reputation like many other companies in the industry, but they are trusted by many professionals since they use the highest quality steel to manufacture their products. You are probably like many other gun safe owners that feel more comfortable if your safe secured to the floor, but you do not want to drill holes in your safe. Many safes do not come with pre-drilled holes, and it will affect the warranty if you drill holes in it yourself. All Stack-On safes come with pre-drilled holes so you can secure it to the floor without affecting the warranty on your safe. You have to pay attention to the warranty on the product you want to see if it fits what you would feel comfortable with since Stack-On has a variety of warranties on their products. The warranties range between a lifetime warranty and one year limited warranty depending on what product you purchase. For more information about Stack-On warranty, click here! Above was a list of gun cabinets that Stack-on offers. None of them is fully fireproof or water resistant – click here to view our list of the best fireproof gun safes if you specifically require that feature. These cabinets are lightweight and are excellent if you have children to keep your guns away. These cabinets do not meet the law in some states. They are also light enough for you to relocate them alone. All of these cabinets have different amounts of storage space, and there is a range of prices so you can find one that meets your expectations. They all have cons but they are priced relatively cheap, and they have great features that you will enjoy in a gun cabinet. Just for this reason, these safes are listed under best gun safes by Shooting & Safety Editors on this post. Hope you find the best fit from various Stack-On gun safe reviews, Feel free to comment! I’m curious what gauge steel is used on the 14-Gun Safe. I would NEVER recommend their products to a consumer. This must be a paid advertisement! Having owned several products from them before, they ALWAYS fail. Customer service will give you the run around to deliver a part to waste time until your warranty runs out! You’ve been warned! Stay away.